Hasegawa released a kit of the experimental Panther F in around 1998. 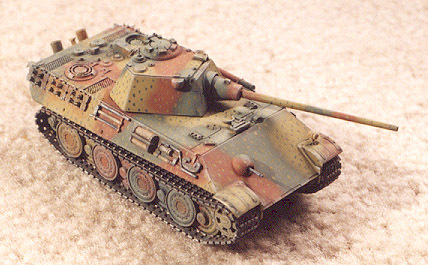 This kit is basically their old Panther G kit, with an added Panther F turret (schmalturm) and a set of late-war steel road wheels. The new turret and wheels are pretty nice. The turret could use a little more detail, which I added on my own (as described below), but I really like the steel wheels. However, did the Panther F have steel wheels? From what I understand, the two prototypes that were built did not have steel wheels. But, considering the material shortages of late-war Germany, it is likely that had the Panther F gone into production, it would have had them. As for the hull, the Hasegawa Panther G hull is very old, and it shows. Instead of using the hull that came in the kit, I decided to use the hull from the new Revell Panther G, which is a beautiful kit. The turret opening in the top of the hull is slightly larger than the turret ring on the Hasegawa turret. But with careful placement, it is possible to glue on the turret with none of the opening showing. The real trick to combining these two kits was when I decided to use Hasegawa's steel wheels. 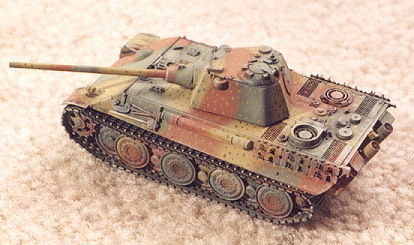 The Revell Panther only comes with the standard wheels. Unfortunately, Revell and Hasegawa used different methods to attach their wheels to the lower hull. The Revell kit has long tubes on the backs of the outer road wheels, which slid through openings in the center of the inner wheels, and onto axles protruding from the hull sides. However, the steel wheels from the Hasegawa kit (which were only the outer wheels) had pegs on them to attach to holes in the inner wheels. To overcome this difference, I cut off the pegs from the backs of the Hasegawa steel wheels. I then carefully sliced off the tubes from the Revell outer wheels, and glued these tubes to the backs of the steel wheels. I then used the steel outer wheels with the Revell inner wheels (you cannot see the inner wheels to notice that they are not the steel variety). It was quite a chore, but I really like the looks of the steel wheels and was determined to use them. The forward hatches do not fit in their holes without trimming. I cut off the handles on the forward hatches, and the rear engine deck hatch, and replaced them with brass wire. I found some scrap wire mesh in my spares box and added engine deck screens for the four, rectangular, air intake ducts. I replaced the bow MG with a better one from my spares box. I also added spare track links. 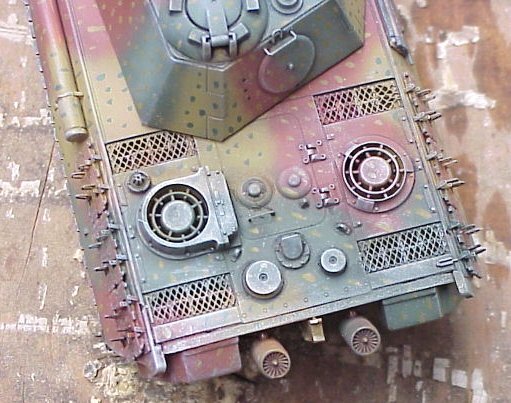 The ones in the kit are too clunky for my taste, so I used the brass ones from Eduard's old Panther detail set. You have to glue the track teeth onto 12 separate links. The teeth are SO tiny and hard to handle that I almost lost my mind after only two links, but they look really good when complete. The kit has the outlines for the spare links molded onto the hull (one of my few complaints about the Revell kit), which should be sanded off. I drilled holes in the three pilzen. I drilled a hole in the antenna mount. I sliced off the poorly-detailed close-in defense weapon port, replaced it with the part from the Revell kit, and glued it in the more correct location. I added three lift rings made from bent wire, one on each forward corner, and one at the rear. I added a little plate over the left rangefinder bump to match the one on the right side (not sure what they're for). I bent a piece of brass strip into a [ -shape and glued it to the front of the gunner's periscope at the left front of the turret as a sun-guard. I added a little latch on the commander's hatch out of a small piece of paper. I drilled a hole near the edge of the commander's hatch to match drawings. I drilled a hole in the right front face of the turret for the coaxial MG. I drilled three small holes in a vertical line to the left of the rear escape for hinge bolts. I added a bolt head in the center of the rear hatch. I added a hand-hold above the rear hatch made from brass wire. Best I can tell, the size and shape of the Hasegawa turret and main gun are accurate, with the exception of the placement of the close-in defense weapon port (I think the antenna mount could stand to be relocated a small bit too, but I didn't think it worth the effort). I didn't add any side skirts. I don't like the ones that came with the Revell kit, and the ones in the Eduard brass detail set are too large (they're designed for the Ausf A model). If I ever get up the gumption, I suppose I could make some from sheet styrene. I should have relocated the gun cleaning rod storage tube onto the rear engine deck. I followed the Revell instructions and glued it to the left hull side (which is also where the drawings in Achtung Panzer show it placed), but most sources seem to indicate that late in the war, this tube was moved to the engine deck, in front of the exhaust pipes. I also passed on putting on any markings. I figure that late in the war, the tanks left the factory to go straight to the front. But considering that this was a "what-if?" vehicle, the modeler can pretty much add whatever markings he so chooses. 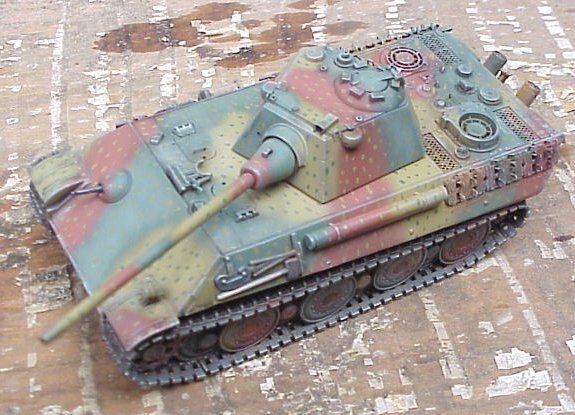 To conclude the project, I painted my Panther F in the standard, late-war, ambush scheme, because I think it looks really cool. But I would imagine that other paint schemes are possible, considering that most of the fighting right at the end of the war was city fighting. 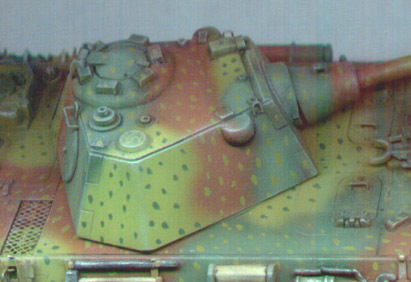 Again, the modeler is pretty much at liberty to paint the tank whatever he wants. I used Polly Scale acrylic paints, and weathered the vehicle with metalizer and chalks. 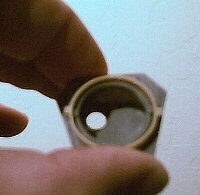 "As an addendum to your Panther F kitbash - if you cut out the turret ring from the Revell kit and cut/sand off all but the ring, it will fit nicely over the Hasegawa schmalturm ring (with a little filing of the nubs -see attachment).... Leading to a nicer fit all the way around, and no need to glue the schmalturm onto the Revell hull top."